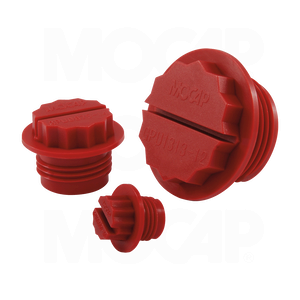 MOCAP General Purpose Plugs are designed for use on Unified/Straight threads and fittings. These Threaded Plastic Plugs are slotted, and feature a 12-point head for screwdriver, socket or wrench tightening. Designed to provide a positive seal on SAE straight-threaded ports. Moulded-in O-Ring style bead seats into the bevel of the threaded opening to prevent fluid or oil leakage. When tightened , an external lip on the flange compresses against the surface to keep contaminants and debris from the part face. Our GPU Series Threaded Plugs are moulded in Red polypropylene plastic and sized to plug threads from 1/8 thru 1/2. Many Sizes of Our General Purpose Plugs for Unified/Straight Threads are Stocked for Immediate Shipment.